What do playwrights in other parts of the world write about? Mogadishu, 1993. Paul is a Canadian photojournalist who is about to take a picture that will win him the Pulitzer Prize. Princeton, the present day, Dan is an American writer who is struggling to finish his play about ghosts. Both men live worlds apart but a chance encounter over the airwaves sparks an extraordinary friendship that sees them journey from some of the most dangerous places on earth to the depths of the human soul. Flying from Kabul to the Canadian High Arctic, THE BODY OF AN AMERICAN sees two actors jump between more than thirty roles in an exhilarating new form of documentary drama. It urgently places these two men’s battles – both public and private – against a backdrop of some of the world’s most iconic images of war. Paul Watson‘s picture of the desecrated body of an American soldier in Mogadishu is imprinted in our heads. U. S. playwright Dan O’Brien composed his rapid story about the crazy photo journalist Paul and the playwright battling his at in a dense and formally demanding language that offers challenging friction for each production (and the translator). The play won a series of awards, most recently the Horton Foote Prize for outstanding new American play. Numerous reviews, including one in the Guardian and one on Oregon Artswatch, report on productions of this journey into the hunger for reality. The play is available in German translation by Henning Bochert. Dan O’Brien is a playwright, poet, and librettist. 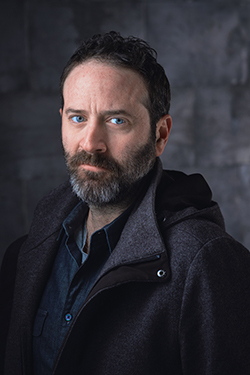 His plays are published by Samuel French, Playscripts, Oberon, Dramatic Publishing, and in numerous anthologies and literary journals including Alaska Quarterly Review and Blackbird. O'Brien has taught playwriting at Princeton University, Sewanee Writers’ Conference, The University of the South (Sewanee), University of Wisconsin-Madison, SUNY Purchase, and in his own private workshop in New York City. He holds a BA in English & Theatre from Middlebury College and an MFA in Playwriting & Fiction from Brown University. He lives in Los Angeles.